If you've tried to order glasses online, you've probably felt confused about the terms and sizing methods requested by various companies. Here's how to decipher the terminology. Glasses are typically measured in several ways. In an attempt to get a good fit, you may be asked for your frame width, lens height, lens width, bridge width and temple length. All measurements for glasses are in millimeters. If you have a pair of glasses that you think fits well, look at them carefully to find the measurements. They may be located on the inside temple arm, which is the portion of the glasses that extend from the frame and fit over the ears to help secure the glasses. The first number represents the lens width. The second number is the bridge width, and the third number is the temple arm length. Sometimes, the numbers wear off. If the frames aren't a brand name, the numbers may be missing. To measure your eyeglasses, you'll need a ruler with millimeter markings. The frame width is the horizontal front of the glasses from one outside corner of the frame to the other. Measure across the top, from hinge to hinge. The lens height is the vertical height of the lens in the glasses. The lens width is the horizontal length of the lens in the glasses. The bridge is the small area that rests on the bridge of your nose. Measure only the part of the eyeglass frames between the lenses. The temple arms extend from the front of the glasses behind your ears. Measure the entire length, from the hinge to the end. Depending on where you order your glasses, the company may ask for all or none of this information. Some online glasses manufacturers offer four sizes of glasses. Small, medium, large and extra large are standard sizes for glasses, but they don't take face shape or the size of your features into account. Just like with clothing, "medium" from one vendor may be a completely different size than "medium" from another vendor. Standard temple arm lengths are 120mm to 150mm, and many glasses manufacturers make only four sizes; 135mm, 140mm, 145mm, and150mm. Standard bridge measurements range from 14mm to 24mm. The eye size, or width of the lenses, ranges from 40mm to 62mm in standard eyeglass sizes. For some people, the distances between their pupils and the center of their nose are not the same. In this case, the measurement from the center of each lens to the center of the nose bridge will be a bit different. Without this important tailor-made detail, the glasses could cause one or both eyes to have to work harder to focus. Getting a pair of glasses that doesn't pinch, dig or slide around can feel like a win. It's important to understand that ill-fitting glasses can cause unpleasant side effects. Getting a headache from temple arms that are too short or that don't fit asymmetrical ears is a common problem. One of the biggest problems is permanent eye damage caused by glasses that don't fit well. Some people may experience sinus pain if their glasses frames rest on their cheeks or pinch their nose. Or they may often experience blurry or obstructed vision because their lenses are often dirty/oily due to repeated eyelash contact. Everyone's face is different, and most people have slightly asymmetrical features, so you may need a temple arm that is a few millimeters longer on one side to prevent the glasses from putting pressure on one ear. There's also more to the bridge measurement than standard glasses offer. Some people have a flatter nose than others. A bridge that is too narrow can cause indentations on your nose and even induce headaches. Having properly fitting eyeglasses helps you achieve the best possible vision with your prescription. While these measurements are useful for finding glasses that come close to fitting your face, it's not possible to get a perfect fit in standardized glasses sizes. Many companies will offer customizable options, but this is still not the same as a pair of frames custom made for you. To get a perfect fit, you need eyewear custom that is made for just you. 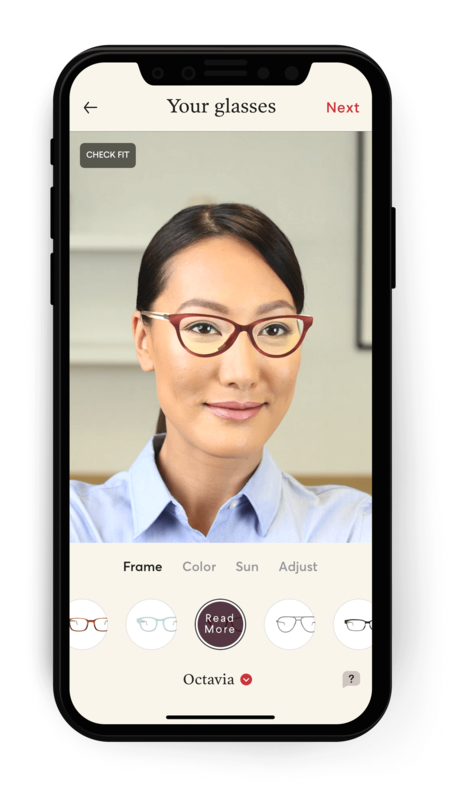 A quick search on Google reveals a couple of makers that will build eyewear from scratch, including us at Topology Eyewear. Need more help with eyeglass sizing? If you still struggle finding eyeglasses that fit you, or if you have any other questions, we are here to help. Just click that speech bubble icon on the bottom right to ask us anything. We will be delighted to help.